On July 30th, Main Street in Ellicott City was hit with a devastating flood forcing businesses to close and people to leave their homes – and cost two people lost their lives. Every year Ellicott City hosts a Music Festival in the Fall for unsigned artists. This year that obviously couldn’t happen, or could it? Merriweather Post Pavilion in Columbia offered its facility to host the music festival with all proceeds going to the flood victims of Ellicott City – 60 bands on 6 stages. 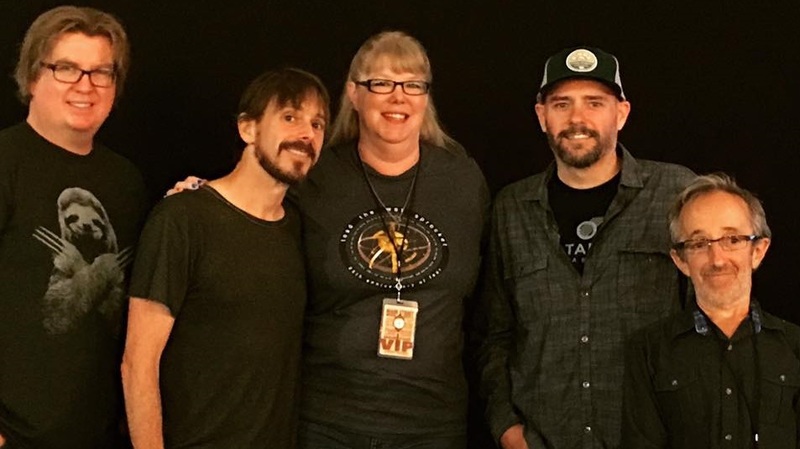 It was a great day with restaurants and shops from Main Street Ellicott City having booths at the festival but the best thing of all was one of my favorite bands Toad the Wet Sprocket generously headlined this music festival for Ellicott City – and I finally got to meet them! I arrived at Merriweather (just 15 minutes from my house) around 4pm and Tom Coale (if you’re from Ellicott City you know who Tom is) checked me in. My envelope said ‘Super VIP’ – yeah I felt important. haha! I had my VIP laminate with access to VIP bathrooms and food and drink stands, but even better was I had a designated seat in my own little box in the pavilion. I first walked around and checked out all the local restaurants and shops who had booths at the festival. I bought an ECstrong shirt then made my way back to my box seat to check out the music. Next up was Jah Works, who played from 5:35 to 6:20pm. They were very good, very mellow and relaxing. In fact, the entire festival was very relaxing. After their set, I walked back to the VIP area to wait for my Meet and Greet with Toad the Wet Sprocket. I got my swag bag with a signed Kelly Bell “Homegrown” single cd and a Main Street Music Festival poster. A few of us were there waiting for a half hour before Randy, Todd, Dean and Glen finally walked in at 7pm. I was the first one in line to meet Toad the Wet Sprocket and get my photo taken with them. Randy, the drummer, was the first to put out his hand to greet me and introduce himself, then Todd, then Glen, then Dean. Although when I got to Glen I went first and excitedly said “Hi Glen!!! I’m Deena SO glad to meet you!! !” I had waited over 20 years to meet these guys, so I was pretty excited. They were super nice and so down to earth. Before the photo was even snapped I asked Glen if they were playing “Come Back Down” and “Know Me” tonight? Glen said, “”Come Back Down” yes “Know Me” no. Then they snapped the photo with my arms around Glen and Todd with Glen kind of leaning his head up to me as I am much taller than he is. As I walking away I asked Glen if they were playing “Fear” tonight (as they had been playing in its entirety this tour since it’s the 25th anniversary), but Glen said no they were not. Then I told him I had missed their show in Baltimore last month because I was sick, but it’s ok because I saw them play “Fear” back in the 1990s. Glen said he was glad I was feeling better. After everyone got through the photo line, Glen stuck around to sign autographs and signed my Main Street Music Festival poster. After, I put my VIP money to use and used the VIP bathrooms. Went to check out the VIP food stands but not much going on there so I went out with the regular people (insert sarcastic tone here) and got some food and took it back to my box seat and ate it during Kelly Bell’s set. They were actually playing with Nighthawks for a bit before going into their own set. It was some great blues, especially this far from Beale Street (that was a Memphis reference if you weren’t sure). During their song “Homegrown,” folks from the Ellicott City Partnership came out on stage, filling the stage. It was quite a moment. By this time, I had moved down to the front rail so I could be right at the stage for Toad the Wet Sprocket who were on next.